The Milky Way may be vast, but some scientists suggest that we are the galaxy's only inhabitants. It’s something people tell me all the time, and usually in hushed tones: “With a trillion planets out there, we really can’t be the only intelligent beings in the galaxy.” In other words, given the enormous amount of real estate in space, aliens are sure to exist. So why haven’t we found any? I don’t dispute this straightforward idea because, after all, it underpins the search for extraterrestrial intelligence (SETI). But not everyone agrees. A recent paper by three researchers at the University of Oxford is throwing shade on those who feel confident that the cosmos is thick with extraterrestrials. The Oxford academics were addressing a puzzle known as the Fermi Paradox, which describes the disconnect between our expectation of many worlds swarming with aliens and the fact that they remain undiscovered. Nearly 70 years ago, the celebrated physicist Enrico Fermi mouthed a deceptively simple question: “Where is everybody?” He made a quick estimate of how long it would take for any society bent on building an empire to colonize the entire Milky Way and realized it was only a few tens of millions of years, which is nearly 1,000 times shorter than the age of the galaxy. This raised an obvious problem: There’s been more than enough time for aliens to spread out, and yet we don’t see them. Perhaps the Fermi Paradox is keeping you awake at night. If so, the Oxford scientists offer some succor. The source of your discomfort, they say, could be your inflated estimate of how many alien societies might be out there. To make such estimates, nearly everyone deploys the Drake Equation — a simple formula that was cooked up by astronomer Frank Drake in 1961. It reckons how frequently intelligent species arise by multiplying the probability that biology will appear with the likelihood that it will become smart enough to develop science and technology. Most people who wield the Drake Equation simply suppose (which is to say, guess) the values of its terms. For example, they might say that the chance that microbes will eventually bubble out of the primordial soup of a watery planet is between one and 10 percent. But the Oxford scientists rightly point out that we really don’t know this percentage with any degree of accuracy. It could be that the probability that biology will arise is many orders of magnitude less. Similar issues apply for some of the other terms in the Drake Equation. 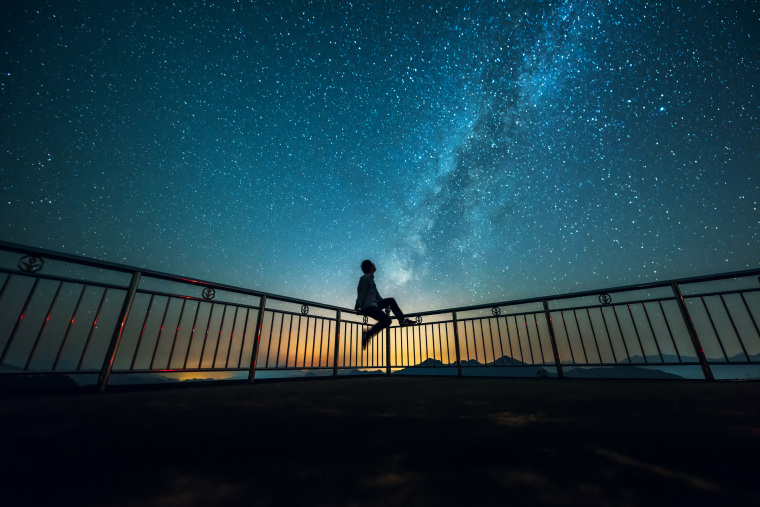 If we own up to the true extent of these uncertainties and do the requisite math, the Oxford study finds that there’s at least a 53 percent chance that we’re alone in the Milky Way and at least a 40 percent chance that we’re alone in the visible universe. Homo sapiens could be the smartest thing going. This result, they claim, melts the Fermi Paradox like butter on a hot griddle — maybe no one has colonized the galaxy because no one else inhabits it. Perhaps now you can sleep better. If so, great, but I can’t. While there’s no arguing against the fact that many of the steps that lead to intelligent creatures have unknown and possibly very low probabilities, that situation could change soon. The discovery of microbes on one of the moons of Jupiter or Saturn — something that might happen while you still have your teeth — would strongly boost the chance of finding life elsewhere, and essentially guarantee that biology is as universal as door dings in a parking garage. At that point, the analysis by the Oxford team could itself dissolve. Frankly, exploration is seldom done well on blackboards. For 2,000 years academics argued over the possibility that a continent-size land mass sat at the bottom of the globe. The ancient Greeks suggested that this was required by symmetry, which may have qualified as a good idea in 350 B.C. A better, if less optimistic, argument could have been made in the year 1600 by noting that all of the waters of the southern Atlantic and Pacific Oceans explored to date were known to be devoid of any large polar continent. Since these two sprawling bodies of water cover 55 million square miles, whereas a land mass the size of Antarctica is 5 million square miles, the a priori chances were more than 10-to-one against there being a continent just out of sight to the south. Obviously this analysis would have been wrong, but it demonstrates that you don’t make new discoveries by computing probabilities, only by investigating — by actually doing an experiment. In the case of the Antarctica hypothesis, that meant sending ships south. We can try to reckon the odds of success in our hunt for cosmic confreres. That’s always worthwhile. But, such exercises should not deter us from an actual search.